The Yankees bounced back from yesterday’s loss by jumping out to an early lead against Jeremy Guthrie and then letting C.C. Sabathia grind out another quality seven-plus inning performance. Although not dominant as he had been in his previous three starts, Sabathia relied on his change-up to pitch around 13 base runners. Of his five strikeouts, four came on a change of speed, which helped Sabathia deal with less than optimal location on his fastball. Jorge Posada reacts to being hit by a pitch in the top of the second inning. Posada would leave the game after scoring on Nick Swisher's triple (Photo: AP). Sabathia was granted a cushion with which to work as the Yankee offense scored six runs over the first three innings of the game. In the first, Nick Johnson swung at a 2-0 pitch and singled in Derek Jeter, who doubled to lead off the game. Johnson eventually scored on a sacrifice fly by Alex Rodriguez. 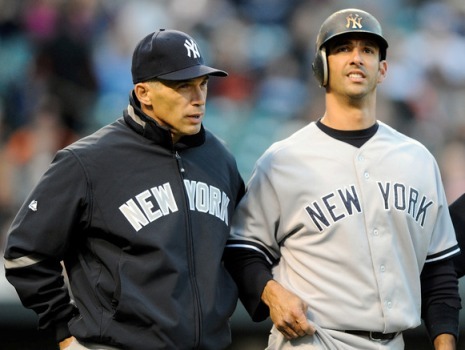 In the second inning, Jorge Posada led off the inning by getting hit by a pitch in the back of the knee. Posada gingerly made his way around the bases after Curtis Granderson singled and Nick Swisher tripled, but he eventually had to come out of the game with a right knee contusion. In the third inning, Robinson Cano continued his hot hitting by belting his sixth HR on the season. Robbie added another hit in the fifth to temporarily push his league leading average over .400. Francisco Cervelli, who was forced into action by Posada’s injury, and Jeter added RBI singles to round out the scoring. C.C. Sabathia is now 10-1 lifetime against the Orioles. Derek Jeter’s first inning 2B was #442 in his Yankee career, tying him with Don Mattingly for third place on the Yankees’ all-time list. Robinson Cano and Jeter both had two hits in tonight’s game. Cano and Jeter have record 77 and 76 multi-hit games, respectively, since the start of 2009. Only Ichiro, with 83 multi-hit games, has had more. Cano’s third inning HR was his sixth of the season, establishing a new personal high for the month of April. With three more hits, Nick Swisher extended his dominance over Camden Yards, where his 1.247 OPS is the highest among all visiting players. Nick Markakis 7th inning HR was the first long ball that Sabathia surrendered in 54 2/3 career innings at Camden Yards. Only Adam Loewen, who threw 58 homerless innings, had a longer stretch. Markakis’ round tripper was also the first regular season HR that Sabathia had surrendered to a left-handed batter since Jim Thome took him deep on August 7, 2009.